There couldn’t be much worse than being the parent or sibling of a horrendous criminal…someone who has randomly shot multiple people for example. Except perhaps being the parent or sibling of a someone who isn’t that criminal…yet. Someone you know isn’t thinking or acting rationally but who is unable to accept the love or help you offer. 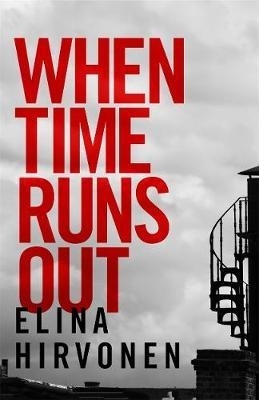 WHEN TIME RUNS OUT is the compelling, sorrow-filled story of a deeply troubled young Finnish man, Aslak, and the family powerless to help him. The book is not concerned with the facts of the mass shooting. We learn only the bare minimum about the mechanics of the incident, which takes place in Helsinki, and the victims of the crime. Instead the book focuses on the people at the centre of events. Part of the story is told from Aslak’s point of view so we learn his reasoning for his actions and something of the events of his life which might shed light on how his thinking developed. Interspersed with his view of the world are the perspectives of Laura, an environmental campaigner and Aslak’s mother, and his sister Aava, a doctor working in the most troubled communities on the planet at least in part because she has been unable to get through to her younger brother. I was a little reluctant to try this book given most reviews make the inevitable comparison with Lionel Shriver’s WE NEED TO TALK ABOUT KEVIN but I am pleased to say WHEN TIME RUNS OUT is, at least in my eyes, a much better exploration of the difficult subject of irretrievably damaged human beings. Hirvonen, a journalist like Shriver, has created characters who are less sure of themselves, less able to label and classify the actions of their loved ones. They observe and struggle and flounder. As most of us would likely do when faced with the unthinkable. In the end I found each of them at least partly sympathetic…even Aslak. None of them are wholly likeable, but it is possible to feel for their pain and their inability to fix the unfixable. There are some flaws, the book does get a bit didactic when espousing Aslak’s beliefs for example. But its sparseness, simplicity and authentic feel to its characters’ struggles make it very, very readable. This entry was posted in book review, Elina Hirvonen, Finland. Bookmark the permalink. I’d think it would be very difficult to write a story like this and make the the characters at least understandable, if not sympathetic, Bernadette. I’m glad that happened here. I’m not sure I’d go for the subject matter, if I”m being honest. But it sounds as though the story of the characters is engaging. Thanks for featuring this one. I’ve often thought that there is always ‘more to the story’ for individuals and their families when these awful acts are committed. I know some families have ignored or contributed to the problem with their damaged person, but I also suspect that some are totally clueless and heartbroken. A tough, tough subject. Sold! Thanks for acquainting me with this book. I don’t ordinarily go for dark stories, but you’ve persuaded me. I just downloaded it! I’m skipping it for now, don’t need stories of such damaged characters. And then there are those who take out their problems on themselves, rather than others. I am gping to buy the book. But i am already moved by the preview and comments thereof.